A good way to start saving energy, cut down emissions and save money at home is to start using energy efficient appliances. And the humble kettle is the most used electrical appliance used in most homes. In fact, the Energy Saving Trust reckons the average household boils the kettle 1,500 every year, so an energy efficient kettle should be on the top of your Christmas list this year. Of course, as well as using an eco-friendly kettle, remember to only boil as much water as you need or you’ll be wasting energy and money every time you brew up. So with this in mind plus an efficient kettle you’ll be saving money and helping the environment. So it’s important not to fill the kettle too much, but, let’s face it, when you’re busy it’s normally a pretty hit-and-miss affair – are you really using the right amount of water? That’s where the Eco kettle comes in. It’s the only brand of kettle boasting the Energy Saving Trust Recommended label. They all feature a clever dual chamber design, meaning you simply press a knob to release exactly the amount of water you want – from one cup’s worth to 1.5 litres. The Eco 3 Kettle Chrome Electronic LD303A is the daddy of the range. As well as heating up the right amount for you, it’ll also get your water to exactly the right heat with its cunning temperature selector. Most people think you need boiling water for the perfect brew, but actually a cup of green tea is best brewed at 80 Celsius, while a great coffee appreciates 90 degree water so this is a winning feature. It all means that the Eco 3 Kettle uses 31% less energy than any other kettle on the market. That’s why it’s been awarded the Energy Saving Trust Recommended label. It’s 2,200 Watts, which is even less than previous Eco Kettles. The Eco 2 Kettle Chrome – LD201A also uses the nifty Eco Kettle plunger mechanism to ensure you only boil exactly what you need. You can measure out as little as 200ml for a single cup, or boil up to 1.5 litres if needed. It’ll save you time, reduce carbon emissions and save you energy and money. Like the other Eco Kettles, it uses just 2,200 Watts of power and comes with the Energy Saving Trust Recommended label, meaning you won’t find a more efficient kettle of its kind around. The Eco 2 Kettle White Standard – LD201A is the same as the other Eco 2 Kettle, but comes in a smart white finish. It packs in the same energy saving punch as the rest, and looks good too. This kettle’s worth buying just for it’s looks, but it’s also a real eco hero. You can heat as little as 300ml of water (max capacity is 1.5 litres) and switches off as soon as it’s boiled. It’s got four temperature settings too – so you can get the water just right for the drink you’re making. What’s more, it’s keep warm function means it’ll keep your water at the right heat for up to 30 minutes, lessening the need to re-boil and use more energy. And it doesn’t stop at that – the Bosch Styline White Kettle has an acoustic signal to let you know when your water’s ready and has a cool body so you won’t get burned. The concealed heating element reduces limescale build-up, and there’s a removable limescale filter to boot. Also comes in black. 3,000 Watts. Costs only £55.81 from Amazon. The Breville Hot Cup with Variable Dispense must be one of the fastest kettles out there – from 0 to boiling in just 40 seconds. Plus it’ll save you energy with its accurate variable dispenser. Choose a small, medium or large drink, up to 300ml, without refilling. And what’s really cool is that you just need to pop your cup under the nozzle and it’ll do the filling for you. No more standing around waiting for the kettle to boil! And with a large 2 litre capacity, you won’t have to keep going to the tap either. 3,000 Watts. Phillips have produced a no-fuss, good looking temperature control kettle, which will help you make a great hot drink and save energy too. The Philips Brushed Metal Eco Temperature Control Kettle has three temperature settings – 80, 90 and 100 degrees, so whether it’s a speciality tea, coffee, or hot chocolate, you’ll get it just right. The one-cup indicator is handy as well and its flat heating element means it’s a fast boiler and easy to clean. It’s got a 1.6 litre capacity and features the Phillips anti-calc filter to make sure you get nice clean water. 3,000 Watts. Costs just £39.12 from Amazon. A fast boiling kettle with 1.5 litre capacity, the Morphy Richards Black Intelliboil Jug Kettle has three energy-saving temperature settings. It’s got a handy one-cup water window and an illuminated water gauge so you can easily fill the kettle to the correct level. It also changes colour with temperature to help you make the perfect cuppa. Plus there’s a removable limescale filter, fail safe cut out and 360-degree cordless base. 3,000 Watts. 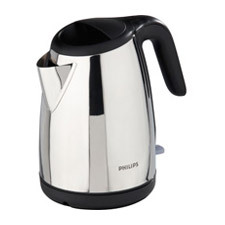 Philips have a great range of energy efficient kettles, and this one is no exception and great value as well. The Philips HD4656 has a 1.7 litre capacity and an easy-to-read one cup indicator and water level gauge. The cordless 360 degree base is simple to use and there’s a cord winder too so it stores nice and neatly. It’s flat element means it’s easy to clean and makes for a fast boil, and, like the other Philips kettles, has a anti-calc filter so you’ll get clean water for your brew. 3,000 Watts. The Philips White Energy Efficient Kettle has a super-clear gauge so it’s easy to measure out just the right amount of water – from one-cup to 1.7 litres. The gauge is repeated on both sides, making it even easier to use, and the kettle has plenty of other handy features – it’s got a cordless pirouette base and a hinged lid to make it easy to fill. And what’s more, to make sure your water’s nice and clean, it’s got a neat anti-calcium filter. 3,000 Watts. And last but not least, if you love the great outdoors, but can’t bear to be without your cuppa, then the Storm Kettle from The Eydon Kettle Company Limited is a must have. Based on a traditional Irish water boiler, you simply fill the aluminium Storm Kettle with water, then light a small fire in its base – you can use anything from small twigs to cones or dry grass to keep it going. The water in the kettle’s double skin heats up quickly from the rising heat, and it boils effectively on even the windiest, wettest days. It’s safe, durable, eco-friendly and light – the perfect present for hikers, campers, fishermen or anyone who loves being outdoors. The original version has a decent 1.5 litre capacity, while there’s also smaller and larger models. Costs only £48.50 from Ethical Superstore. And what’s more, if you buy the Storm Kettle you can also rustle up a quick meal using the Storm Cook Kit. It features a saucepan, frying pan and handle for an ideal lightweight cooking kit. It just clips onto the top of the Storm Kettle. Voila – easy outdoors eco-friendly cooking.